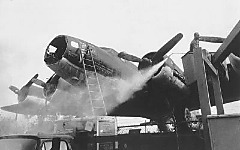 The "Memphis Belle", a Boeing B-17, was retired from active service in the European theater of World War II after 25 successful bombing missions and returned to the US for touring, moral support and display. At the time the "Belle" was flying combat, there was no long range fighter protection over Europe, and because of this the loss rate was around one-third per sortie - 1 plane out of 3 did not come back. Morale was extremely low because 80% of the bombers were shot down during the first three months of America's combat flights over Europe. Moral was low among the crews, and their families back home. It was decided that a boost in moral was needed on the home front, so a decision was made to send the first aircraft and her crew to complete the required twenty-five combat missionÕs home to the United States to go on a war bond tour. The idea was to show the folks back home that it was possible to survive the dangers of air warfare even at a time when fighter cover was not available. The "Memphis Belle" was NOT the first plane to accomplish this however. That distinction goes to "Hell's Angels". 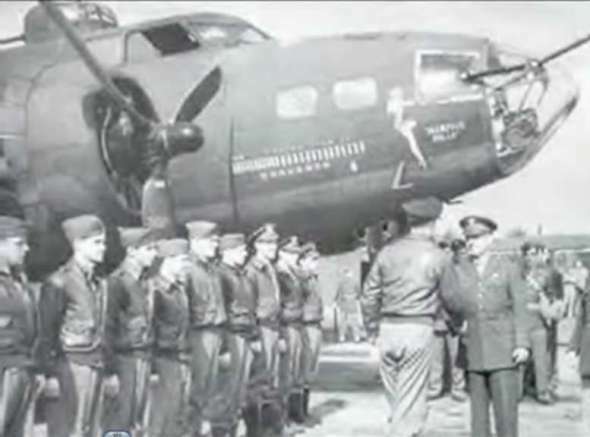 Unfortunately, some of her crew were killed completing her twenty-five missions and due to her name, "Hells Angels", the powers in Washington decided that the "Memphis Belle" would make a better impression and sell more bonds. So the "Belle" toured and made Americans proud. Although General Henry H. "Hap" Arnold had given Morgan permission to fly the B-17 as low as he pleased during their tour, it's almost certain that the general hadn't meant for the bomber to buzz rooftops as she made her way across the nation. Nonetheless, when Morgan piloted Belle to an event in his hometown of Asheville, N.C., he brought the big bomber in low, barely skimming the roofs of downtown buildings and seemingly aiming for the city hall and courthouse. There was some space between the two buildings, but not enough to accommodate the 103-foot wingspan of the B-17. Just moments before Belle would have crashed, Morgan flipped her on her side and blasted through the gap -- vertically. Some startled observers on the ground muttered that whoever was piloting the plane should be court-martialed. Morgan again put on a good show in Memphis, the second stop on the tour. Once more someone mentioned a court-martial for the pilot, this time a high-ranking military officer. One Memphis newsman wrote: "He had a special reason to pull out all the stops here. Waiting on the ground was the girl he loved (Margaret Polk), the girl he was engaged to marry. A cocky young man always wants to strut in front of his girl." Morgan and Polk never quite made it to the altar, but they remained lifelong friends after their romance ended. As for Belle, she would eventually end up in the city that she was named after. After her public relations tour, Belle had been assigned for a time to a training command. 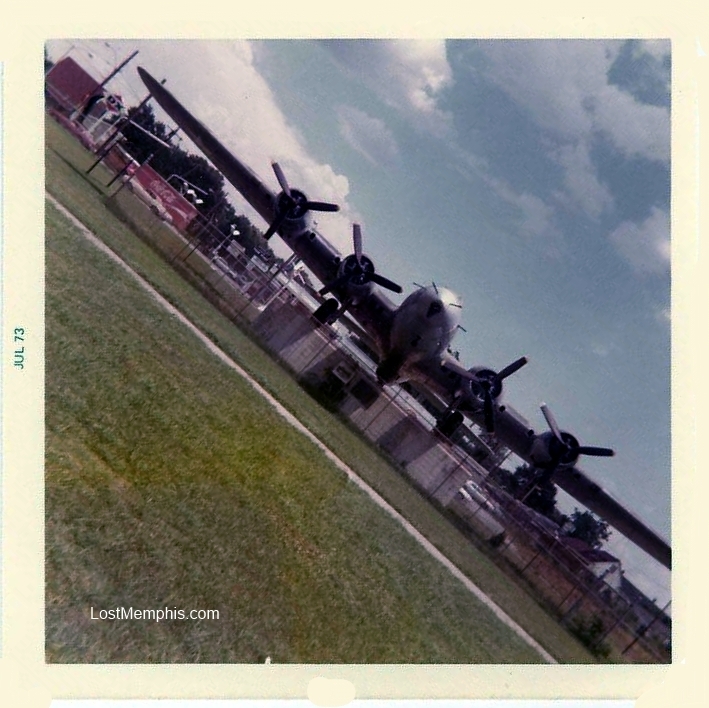 But in 1945 she ended up in the aircraft boneyard in Altus, Okla., waiting to be scrapped. An enterprising reporter saw her, wrote a story on her plight and contacted the mayor of Memphis. After almost being destroyed in post war recycling, the famous plane was saved for history (and FROM the Air Force) by then Memphis Mayor Walter Chandler. 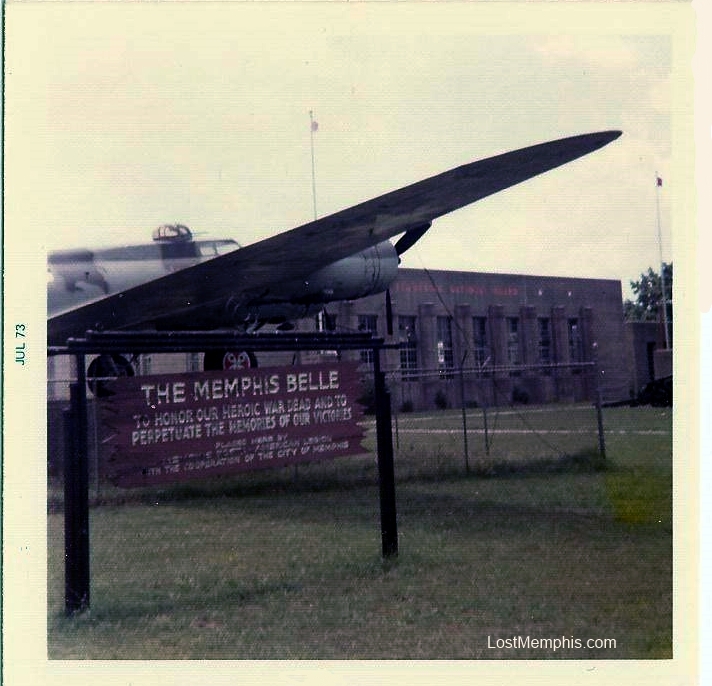 He purchased the plane for $350 (original cost:$314,109)and on July 17, 1946, had it flown to Memphis and in 1950 it was displayed on a pedestal in front of the National Guard Armory at Central and Hollywood. This famous icon of World War II sat on display (unprotected from the elements) on the concrete stands for 27 years. A few mayors later, the airplane was donated back to the Air Force, who left custody with the city, but by this time realized the value of the plane and had started making noises about wanting the plane back, to be properly restored and protected in the Dayton Air Force museum. In November, 1977, she was moved to the Air National Guard at the Memphis airport. During these years the vandals did what the Germans couldn't. They almost destroyed her! For the next nine years various fund raising efforts were made to restore the Belle. After a relentless, last ditch effort by Frank Donofrio, a local businessman, the City agreed to donate a piece on land on Mud Island, where the historic bomber could be displayed. Federal Express and Boeing each donated $100,000 toward her restoration and the City donated $150,000. When Hugh Downs of TV's 20/20 aired the need for more money, the American people rose to the challenge and donated the rest of the $576,000. In the 80's a push was made to get the plane out of the weather - funds were raised, but not enough for a proper building. So a tent type awning that was open around it's base enough for visitors to pass through was erected on Mud Island (yet another Memphis success story) and the Belle was moved to it's new location with great fanfare. 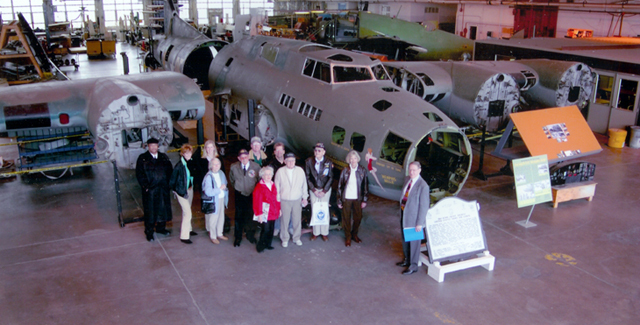 The MEMPHIS BELLE was saved and restored to a place of honor. 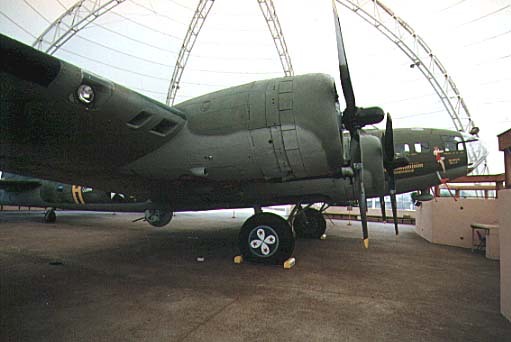 On May 17, 1987, 44 years after she flew her 25th mission, the Memphis Belle Pavilion was dedicated. Nearly 25,000 attended. Seven B-17's, the largest formation since WW II, flew overhead in salute and "bombed" the pavilion with thousands of rose pedals. Margaret Polk and the Belle crew looked on as the crowd cheered thunderously. A fitting tribute to the grandest lady of the sky! The Air Force has declared the Belle a national historic treasure. She will never be flown again! On August 29, 1992 Morgan completed his 27th mission. He married his present wife, Linda, in front of the Belle. Gen. Paul Tibbets, pilot of Enola Gay, gave the bride away! In hindsight, this was not the best idea for plane storage as the heat in the tent was elevated and the lack of enclosure meant the plane was still exposed to the elements, but not as directly as it had been. Bird droppings are a new hazard of the new location as well. Unfortunately, right next to the Mississippi River in Memphis in the summer is a pretty humid place. End result. The plane is still not protected and the Air Force now really wants it back. This goes back and forth for a few years, an association is formed to restore the plane again and put it in a "real" museum with "real" protection from the elements. There were a number of qualified volunteers to do the restoration, and they moved the plane to a hanger at a Millington, TN airport, started the process of raising money, securing a location for the display building, etc. While these core group of volunteers were intent on being successful, Memphis as a whole never paid much attention to the effort. City goverment was MIA on this one, and ultimately, the Air Force got their plane back. The Memphis Belle- The Final Chapter in Memphis, is a documentary film by Ken Axmaker, Jr. that focuses on the history of the Belle in Memphis and emphasizes these final days and the volunteers who tried to keep one of the most famous aircraft in the world and another Memphis icon from disappearing. The "Memphis Belle" lives in Dayton now, has a good home with the Air Force and is being treated with the kind of respect it deserves. Except for the hardworking few who tried to keep it here, Memphis has hardly noticed it's gone. The Memphis Belle flew its 25th and last mission with a different crew on May 19, 1943, to Kiel, Germany. It was then flown back to the United States on June 8, 1943 by Morgan's crew for war bond tours. The plane was named for pilot Robert K. Morgan's sweetheart, Margaret Polk (a direct descendant of a former President). The famous Petty girl nose art was painted by the 91st's group artist Tony Starcer.